One of the most cryptic of Heidegger’s terms is what he calls, as part of the Fourfold (das Geviert), the gods. In this Log entry, my aim is not to provide a history of this term in Heidegger’s corpus, contextualise it within his ontology, pitch explanations against each other, or explain it in relation to the Fourfold overall, but to simply highlight the importance of the gods when thinking the various crises we face today. Why should we rethink the term gods today? Why might it be urgent to give ourselves time to rethink this problematic expression? The reason I don’t want to explain the gods or debate the kinds of Heideggerianisms that read the Fourfold with the only aim to yet again explain it (often erroneously), judge it (unnecessarily), or even discard it (without understanding it) is because I explore this topic in some lengths not only in already published essays (see “Time Unshackled” and “Between Earth and Sky”), but also in a forthcoming publication, Curating as Ethics. My intention here is simply to underscore the importance of looking at this odd term, which, as is well known, Heidegger borrows from Hölderlin. Heidegger’s gods are crucial if we want to extricate ourselves from the contemporary predicaments that we face and I will explain later on what I mean by this. So why the gods today? Out of me, but also with me, mortal, earth and sky—the event of being. Away from, but entirely dependent on this event, the gods: this ‘is’ the fourfold according to Heidegger. The event is that of a mortal extracting itself and engaging with earth and sky, a “dwelling” event intruded upon by reliant, but unruly gods. 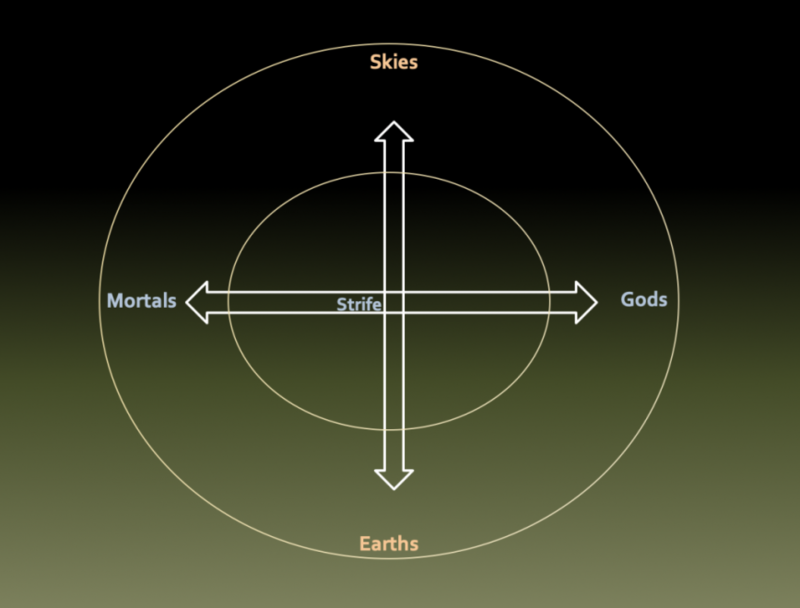 The four folds (mortals, earth, sky, gods) are not proper physical, metaphysical, or religious compass points. They have no proper equivalent in the world (or in another) because they stand, however difficult this is to imagine, for the very advent of time-space. The four participate in and as this event; they take part in the fact that I ‘am’ here, on this earth, mortal, under the sky. There would be no being, no other,and no world without this four-dimensional quasi-structure that utterly defies the entire arsenal of archic and telic representations and their inevitable epochal stampings thus also fracturing all singular points of view, exclusive vistas, and uniform narratives. We need to think of ourselves as four and not just one or two. Considering such poly-logicality, the fourfold is then not just about mortals or about things; it is also and above all about the event of time-space that structures them. Out of me, as one dimension of the fourfold, and out of gods, earth and sky, time-space arises, dwelling in the unconditioned. But what’s the point of focusing on the fourfold? The fourfold makes us aware of the conditions that make events possible. Since it constitutes the very advent of time-space, the fourfold effectively is the prerequisite for any form of happenstance. As James Edward says: “Each of the four is… intended to put in someone’s mind the particular conditions that make possible… the life that brought to presence the actual thing… before us.” So for example, my existence is conditioned by a number of factors: the ground out of which humanity grew, the sky into and against which it elevates itself and allows me to breathe and work, my parents who made me mortal, and the divinities, this dimension intrinsic to mortals that, as I shall demonstrate, structure and radically disturb my living-present. It would be wrong to think that this conditionality is a causality. Because the fourfold creates time-space, this conditionality is relative to the always accidental occurrence of any given spatial and temporal configuration engaging mortals/gods surging with earths into and against the skies. Three of Heidegger’s four dimensions (mortals, earth, sky) are somewhat self-evident: ‘Earth is the serving bearer… The sky is the vaulting path of the sun… The mortals are the human beings.’ The burning question is always the one concerning the gods. How is one to understand the last dimension of Heidegger’s fourfold: the gods [Götter]? The only way to make sense of the gods outside of any theological or religious contexts is to think of them as an inescapable dimension of mortals. Mortals basically also happen to be gods. To say this does not imply that mortals are somehow also immortal or that they are superhuman beings or spirits that need to be worshipped, looked up, or adored in order to secure salvation or redemption. The nomination gods is used here most simply as another word for mortals, that is, for finitebeings and nothing else. The reason this is the case is simply because there is effectively something about finitude that isn’t quite right and this is precisely why the juxtaposition or interchangeability works. How is one to characterize this, once again outside of any theological or religious contexts? Let me begin by saying that the main gist of this non-theist, non-deist, non-theological and non-religious suggestion that mortals also happen to be gods is that the suggestion itself cannot be dissected, analysed, approved, or disproved. This does not immediately invalidate the argument or relegate the issue to the metaphysical realm and therefore to some nebulous and quaint transcendental philosophy that, on all accounts, has already being dumped in the dustbin of history. To say that mortals also happen to be gods is simply to recognize that mortals’ thought, no matter what, always follows a certain structure of faith, that this structure makes of them gods, and that this is not something that can easily be axed as true or false. This reference to thought does not relegate the issue of mortals/gods to the realm of the mind alone. Thought is here understood not as the intellect alone, but as the heart and the demand itself. As such, thought is not something that can be quickly and efficiently identified; it is an event that takes place at the limit, marks the limit, is itself the limit. Thought is effectively a bodily event: the breaking through of the form of the sensible as sense, a breaking through that never reaches a breaking point, “a final thought,” for example. Through thought then, mortals exceed themselves and this is why, they also happen to be gods. The crucial thing about this excess is therefore the never ceasing supplementary process that always occurs in thought. Thought cannot not exceed itself. It cannot not think the maximum it is able to think. It always exceeds even the highest thought conceivable, managing in the process to exceed its own power to think. Jean-Luc Nancy talks about this excess in a quick commentary on Saint Anselm’s famous text, TheProslogion, in his book Dis-enclosure. He writes, “thinking… can think—indeed, cannot not think—that it thinks something in excess over itself. It penetrates the impenetrable, or rather is penetrated by it.” This has nothing to do with a banal transcendental movement, a going beyond or a prayer that no reason could attest to. Nancy is quick to highlight that his interest in Anselm’s effort is only to catch the way thought takes place. Thought is not just finite; it is marked by an extraordinary unconditionality that prevents it from simply delimiting itself as a simple assemblage of inherited and repeatable ideas. This radical unconditionality that occurs in thought is again what makes mortals gods. Mortals open up the future by being always caught up infinitely in their finite condition. They are gods precisely because of this ordeal of thought that disturbs or disrupts the shackles of mortality and this, even if they are the most stringent of atheists or agnostics. Now, inevitably, the questions beckon: why give this ability to exceed thought the name gods? Why bother with a denomination that always refers to what is superior to mortals? Do we really need this old reference to characterise the an-archic or an-telic structures of mortal thought? Should we not in our materialist, pragmatic, consumerist, and scientific world, not evade a type of vocabulary that is so stained with fratricides and genocides? Should we not be able by now to grasp the excess that caries thought out of itself without automatically having recourse to the idea of god? Can we not be mortals without necessarily assuming being also gods sparking a beyond that never ceases to withdraw itself? And finally, should we not be able by now to refer to this desire beyond need without also referring to some imagined phantasm? I accumulate here the questions to emphasise that I am aware that using the word gods to reference this excess of thought is not just problematic, but effectively a scandal for thought: what is radically unacceptable in the face not only of humanity’s sovereign rationality, but also of humanity’s unrelenting violence, cruelty, and destructiveness. How can we be gods in this rational and violent hegemony? And yet, a number of fundamental reasons impel me to insist that Heidegger is right in using the word gods. Firstly, using the word gods to qualify mortals’ ability to exceed themselves beyond thought is intended to simply highlight a type of nomination that, for good or bad, exceeds all concepts. After all, this is what the word God stands for, that is, for a nomination distinct from any nomination of concepts and as such is the only one to expose this excess. Put simply, it is the name of a relation with what knows no return. God never speaks back. Thought exceeds itself even if there is no answer coming back. As such, thought always reaches out towards what knows no pre-determined return. It is this reaching out, this excess that indeed constitutes, if not the faith that structures thought, at least its scandal. Reason cannot do without this scandal. It structures thought even if it adheres to the most stringent of formal or mathematical logic: there will always be the possibility of its absolute disruption. To think otherwise is nothing short of fascism. It is indeed to revert to the most worrisome of logics, the ones that precisely lead to inalienable truths, the imposition of the same, the rejection of the other, etc. Using the word gods for mortals is therefore first and foremost to emphasize the importance of evading the dictatorship of concepts and the impossibility of doing away with either faith or scandal. Secondly, but most importantly, using the word gods is an attempt to destabilise the monopoly held by our own two contemporary gods: the God of the Abrahamic tradition and the God of money. Whether one obeys the God of monotheist religions or the God of capital, one is always obeying a tautology: God equals God or money equals money (the latter not in an equivalence between currencies, but within currencies, i.e. one dollar equals one dollar). These two tautologies rule our contemporary lives because they are the only absolute values superseding and regulating all others. They stand for the only language referents able to mediate and regulate all other exchanges in language. From procreation to death and from inorganic events to natural disasters, God or money regulates the world with two types of return: in another life (the God of religion) or in this life (money). They are no other options, but these sovereign traffics regulating the lives of both religious and secular men and women. How can one break such indomitable two-fold sovereignty? By precisely bringing the referent God down to the level of mortals, that is, by precipitating an absolute value to the level of finitude. In doing so, the aim is to encourage mankind to think of returns other than those provided by God and/or money. This aim will not break the monopoly of the two absolute tautologies ruling our lives, but it will at least raise the question of their omnipresence. We are gods because we are the only absolute values worth considering. Thirdly, using the word gods to indicate mortals is also a way of rejecting any form of hierarchy including that put forward by organised religion with god(s) above and mortals below. To qualify mortals as gods is not to determine anything to have a supernatural structure, but to precisely disqualify the very possibility of such a structure. It is to precipitate the very idea of the divine down to the level of mortals without hierarchy. In doing so, I am not elevating mortals to a special status. I am not unconsciously replicating here Psalm 82:6 and John 10:34 in which local magistrates, judges, and other people who held positions of authority were suddenly qualified of gods. As the focus on thought above hopefully shows, no mortal is here given any authority over other human beings, no one is qualified as a demi-god, demiurge, or demon, and no one is assumed to derive his or her power and authority from God Himself. To say that mortals also happen to be gods is, on the contrary, to destabilise all forms of sovereignty and to highlight, through the excess of thought, an absolute equality trumping all equalities of concepts. Mortals also happen to be gods and this, no matter who they are. Finally, but most importantly, to say that mortals also happen to be gods is to remove from the determination gods any kind of moral value. Mortals are not always sinful and gods are not necessarily exempt from sin, the bad does not reside in mortals and the good in gods. The good is conceived here in the same vein as Nancy’s reading of Anselm. If there is a desire to exceed thought, then this desire cannot be structured by an economic return whereby whomever thinks over and above themselves expects a payback or a reward. This is, on the contrary, a desire for what is beyond satisfaction and as such cannot be entered into the category of need, neither as a mean nor as an end, let alone as a prayer in the conventional sense of this term. As such, if mortals recognise their godly selves, then their recognition is a desire without end, it is an excess that can only exceed itself over and beyond any form of satisfaction. In this way, free of any form of standard or right, free of the constraints of “good intentions” and “good consciences,” mortals/gods expose the good only as they exceed themselves beyond what the value “good” stand for today, an excess, a good that is nothing other, than what they themselves are. These are some of the reasons why I think Heidegger’s term gods is crucial today. As I hope it is self-evident, such dimension requires us to think of ourselves in more than one (being, becoming, for example) or two dimensions (same/other, for example). Living beings are complex. We need a way of approaching the dilemmas of our world that is in tune with the way we operate as fourfolders, if I can say such a thing, able to open up the future like gods that we are. The fourfold is indeed our new constellation. It is by recognizing this poly-logicality, this play of our own earths and skies, that we can playfully exceed our capacity to think, thus midwifering a new world, that is, a new set of constellations made up of in-finitely ex-posing dimensions hereto unimaginable. Heidegger’s account of the Fourfold is scattered through a number of texts that span nearly twenty-five years, from a first mention in his 1949 essay “Insight Into That Which Is” all the way to his 1973 seminar in Zärhingen. See, Martin Heidegger, Bremen and Freiburg Lectures (Insight Into That Which Is and Basic Principles of Thinking), translated by Andrew J. Mitchell (Bloomington: Indiana University Press, 2012) and Martin Heidegger, Four Seminars, edited by Andrew J. Mitchell and François Raffoul (Bloomington: Indiana University Press, 2012). The most well-known account of the Fourfold can be found in his essays: Martin Heidegger, “Building, Dwelling, Thinking,” and “The Thing,” in Poetry, Language, Thought, translated by Albert Hofstadter (New York: Harper Perennial, 1975), pp. 141-60 and 161-84, respectively. Mention of the Fourfold is also made across a number of other publications including: Martin Heidegger, Contributions to Philosophy (Of the Event), translated by Richard Rojcewicz and Daniela Vallega-Neu (Bloomington, Indiana University Press, 2012); Martin Heidegger, Mindfulness, translated by Parvis Emad and Thomas Kalary (London: Continuum, 2006); and, of course, his readings of Hölderlin: Martin Heidegger, Elucidations of Hölderlin’s Poetry, translated by Keith Hoeller (Amherst: Humanity Books, 2000) and Hölderlin’s Hymns, “Germania” and “The Rhine,”translated by William McNeill and Julia Ireland (Bloomington: Indiana University Press, 2014). For analyses of the Fourfold, see Andrew J. Mitchell, The Fourfold, Reading the Late Heidegger (Evanston, Illinois Northwestern University Press, 2015); Jean-François Mattéi, Heidegger et Hölderlin: Le Quadriparti(Paris: Presses Universitaires de France, 2001); Frank Darwiche, Heidegger, Le Divin et le Quadriparti (Nice: Les Editions Ovadia, 2013), Reiner Schürmann, Heidegger on Being and Acting: From Principles to Anarchy(Bloomington: Indiana University Press, 1990) and Reiner Schürmann, Broken Hegemonies, translated by Reginald Lilly (Bloomington, Indiana University Press, 2003). See also, David Crownfield, “The Last God,” in Charles E. Scott, Susan Schoenbohm, Daniela Vallega-Neu, Alejandro Vallega, eds., Companion to Heidegger’s Contributions to Philosophy (Bloomington: Indiana University Press, 2001), pp. 213-27; James C. Edwards, “The Thinging of the Thing: The Ethic of Conditionality in Heidegger’s Later Work,” in Hubert L. Dreyfus and Mark A. Wrathall, eds., A Companion to Heidegger (London, Blackwell, 2005), pp. 456-67; and Mark A. Wrathall, “Between the Earth and the Sky: Heidegger on life after the death of God,” in Mark A. Wrathall ed., Religion After Metaphysics, Cambridge, Cambridge University Press, 2003, pp. 69-87. The pronoun “me,” does not refer to an ego as such, but to a mortal co-original with earth, sky and gods. The event of being (Ereignis) must not be confused with ‘mortals’ or Dasein, both of which refer, at different registers, to one dimension of this very event. The event of being includes mortals, gods, earth, and sky, each participating in this event as expropriating movements. Thinking four expropriating movements at once avoid mono-logical and mono-theistic (and therefore historial) interpretations of being. See, Heidegger, Contributions to Philosophy (of the Event). For a commentary, see, Richard Polt, “Ereignis,” in Dreyfus and Wrathall, eds., A Companion to Heidegger, pp. 375-91. Obviously, the four do not end up creating a supra-representational structure because each is understood as an expropriating movement. See Heidegger, “The Thing,” in Poetry, Language, Thought, p. 178. I deliberately leave this “other” here unexplained. The reading of Heidegger’s gods that follow should assuage all those who fear that the other has yet again been violently re-appropriated in the event of being. The number four has no mystical, magical, religious, or apocalyptic meaning. As many commentators have shown, it is the outcome of the history of being and that of the world as analyzed by Heidegger through and beyond his readings of Hölderlin. For a mystical reading of Heidegger, one that is not followed here, see John D. Caputo, The Mystical Element in Heidegger’s Thought (New York: Fordham University Press, 1986). For a further commentary, see Mattéi, Heidegger et Hölderlin: Le Quadriparti. As Reiner Schürmann superbly says, with the fourfold, “the ‘mortals’ find themselves, as it were, marginalized.” Schürmann, Broken Hegemonies, p. 211. James C. Edwards, “The Thinging of the Thing: The Ethic of Conditionality in Heidegger’s Later Work,” in Dreyfus and Wrathall, A Companion to Heidegger, p. 458, my emphasis. Heidegger, “Building, Dwelling, Thinking,” in Poetry, Language, Thought, pp. 147-8. Jean-Luc Nancy, Dis-Enclosure: The Deconstruction of Christianity, translated by Bettina Bergo (New York: Fordham University Press, 2008), p. 11. Marx obviously made this point way before me when he wrote: “A particular kind of commodity acquires the character of general equivalent, because all other commodities make it the material in which they uniformly express their value.” Karl Marx, Capital: Vol 1, ed. Friedrich Engels, translated by S. Moore and E. Aveling (New York: Lawrence & Wishart Ltd, 2003), p. 79. On the way natural disasters are recuperated by the principle of general equivalence, see Jean-Luc Nancy, After Fukushima: The Equivalence of Catastrophes, translated by Charlotte Mandell (New York: Fordham University Press, 2015).